A new mineral rush is underway in the upper Midwest of the United States, especially in Wisconsin and Minnesota, for deposits of high-quality frac sand that the mining industry calls “Northern White” sand or “Ottawa” sand. Frac sand is a specialized type of sand that is added to fracking fluids that are injected into unconventional oil and gas wells during hydraulic fracturing (fracking or hydrofracking), a process that enhances petroleum extraction from tight (low permeability) reservoirs. Frac sand consists of natural sand grains with strict mineralogical and textural specifications that act as a proppant (keeping induced fractures open), extending the time of release and the flow rate of hydrocarbons from fractured rock surfaces in contact with the wellbore. The current sand mining surge has been driven by the boom in unconventional oil and gas production that has been largely spurred by advancements in technology promoting the expansion of hydraulic fracturing and horizontal drilling over the past decade. Because of its superior quality, the sand of the upper Midwest not only supports the majority of domestic oil and gas production, but it also supplies frac sand to some of Canada’s western shale basins. The principal sources of “Northern White” or “Ottawa” sand in the upper Midwest are the Middle and Upper Ordovician St. Peter Sandstone and the Lower Ordovician and Upper Cambrian Jordan Formation, with the Upper Cambrian Wonewoc and Mount Simon Formations gaining in importance. Additional frac sand sources to the south include the Upper Cambrian Hickory Sandstone Member of the Riley Formation in Texas, which is referred to informally as “Brown” or “Brady” sand, and the Middle Ordovician Oil Creek Formation in Oklahoma. More than 40 United States industry operators are involved in the mining, processing, transportation, and distribution of frac sand to a robust market that is fast-growing in the United States and throughout the world. In addition to the abrupt rise in frac sand mining and distribution, a new industry has emerged from the production of alternative proppants, such as coated sand and synthetic beads. Alternative proppants, developed through new technologies, are competing with supplies of natural frac sand. In the long term, the vitality of both industries will be tied to the future of hydraulic fracturing of tight oil and gas reservoirs, which will be driven by the anticipated increases in global energy consumption. Contains: geospatial database. Refer to the Metadata file for more information. 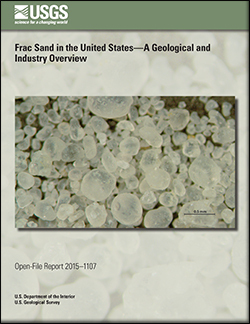 Benson, M.E., and Wilson, A.B., 2015, Frac sand in the United States—A geological and industry overview: U.S. Geological Survey Open-File Report 2015–1107, 78 p., https://dx.doi.org/10.3133/ofr20151107.